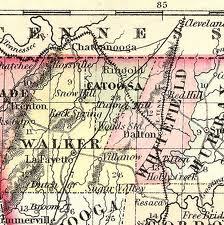 As early settlers streamed into what would become Catoosa County in the 20-30 years prior to the county’s birth in 1853, and with the biggest surge coming after the removal of the Cherokees in 1839 and another following the arrival of the railroad, the U.S. government implemented policies to encourage development of western territories. In March 1853, Franklin Pierce became president, fully supporting territorial expansion. Pierce supported the Compromise of 1850, championed by Sen. Henry Clay of Kentucky to bring together anti-slavery and pro-slavery supporters. Some historians believe the compromise did more to divide the factions over the next decade than bring them together. According to “The History of Catoosa County” by William H.H. “Bill” Clark, many of Catoosa’s early white settlers were families just passing through on their way westward. Those who stayed were mostly farmers. The arrival of the Western & Atlantic railroad in Ringgold in 1849 turned the quiet village, which had formed in 1847, into a boomtown complete with saloons, distilleries, stores and mills, according to Clark. The town quickly grew to about 1,500 residents. A member of the Head family provided an oral history of the area that the Catoosa County Record printed in the late 19th century. A Civil War veteran, John Dawling, saved the clippings in a scrapbook, which Earle McDaniels borrowed in the 1920s, copied and later passed on to Clark. In his account, Head recognized the purchase of Catoosa Springs — an antebellum resort operated by a Mr. Hickman, Mr. Battey and Dr. McDonald — from William Murray, as the turning point for the formation of the new county. This action helped influence the naming of the county after the resort. 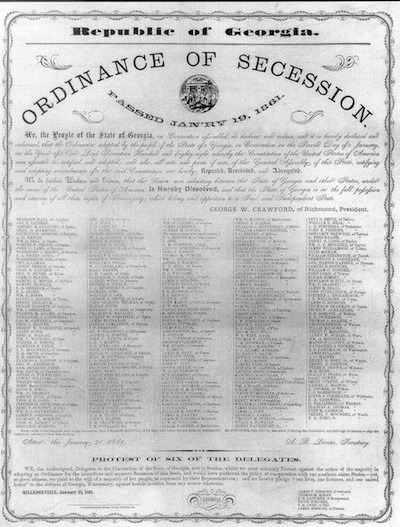 On Dec. 5, 1853, Georgia lawmakers carved Catoosa County from Whitfield and Walker counties. Ringgold saw tremendous economic growth in 1853, with several new stores opening. Among them was a brick storehouse owned by William L. Whitman and Joseph Whitsitt, built on the corner of Nashville and Tennessee streets — the present location of Price Ringgold Drugs. The county’s inaugural year also brought devastating disease to its residents. According to Head’s oral history, Dr. Andrew Patterson, who owned a large medical practice in Ringgold, had his hands full dealing with Catoosa’s cholera epidemic of 1853. Cholera, a severe and painful, infectious disease that if untreated can cause death, broke out in Knoxville, Tenn. and Chattanooga, Tenn. before making its way here. Head writes that Buck Williamson, a carpenter, was roofing the Triplett family’s house on the grounds where the Methodist Church (Ringgold Wedding Chapel) now stands, when he began to feel ill. Williamson climbed off the house, laid on a workbench and was dead about two hours later from the disease. Catoosa saw several more cases. “Thomas Dickson was stricken at the supper table. … He was the only person in Ringgold that recovered from an attack of cholera,” Head wrote. Cholera claimed seven more Catoosa victims over the next 15 days and then the disease faded. Throughout the 1850s, Catoosa County and Ringgold grew by leaps and bounds as citizens labored to forge a living from soil and trade. On the horizon of the county’s second decade, many of its green pastures would be stained red from the strife to come between the Blue and the Gray.